The Westcott Mini Apollo Flash Kit adapts your shoe-mount flash, enabling it to light your subjects with soft, even light. It was designed for your flash unit while it is mounted to a light stand. This kit includes a 16 x 16" (40 x 40 cm) Mini-Apollo Softbox, Hot Shoe Mount with an umbrella Bracket and an L-Mounting Bracket. The Shoe Mount allows you to attach the flash to a standard lightstand. If your flash is tall and touching the top of the Apollo with just using the Shoe Mount, the L-Mounting Bracket allows you to mount the flash lower within the Apollo. The Mini-Apollo mounts just like a standard umbrella and the silver interior allows for maximum light output. Box Dimensions (LxWxH) 30.5 x 4.5 x 4.3"
Mini Apollo Flash Kit is rated 3.6 out of 5 by 12. Rated 4 out of 5 by Anonymous from Nice softbox at a reasonable price This softbox produces nice soft light - expecially if the flash is mounted facing the back of the box, allowing the light to reflect around inside before hitting the diffusor in the front. Setup is very quick and easy. The internal umbrella structure does have two slight drawbacks: (1) the center umbrella pole extends all the way out to the diffusor and casts a slight shadow; (2) the center pole prevents a flash from being mounted in the center of the box, and makes it somewhat difficult to use a larger flash (such as the Nikon SB-900). All in all, this softbox is a good deal for the price. Rated 2 out of 5 by Nev from Definitely a poor substitute I intended to use this softbox as a catch light on location and am sorely disappointed. Construction is flimsy, mounting the flash is awkward, and once mounted, you have to unzip the closure to access flash controls. It is difficult to direct the light inside the box because of the way it has to be mounted. It is light weight, and the light produced is nice and soft, but it is difficult to control because of the aforementioned issues. Not something I would purchase again or recommend. Rated 1 out of 5 by Wacky D from Works but cumbersome The quality of the diffused light is nice but this thing is a pain to use. It is not designed well at all. It is a pain to set up and the screw system it uses comes loose requiring you to re-adjust constantly. Also, If you set it up like the directions state with the flash bulb forward, you will not get much diffused light. The light is just too close to the white fabric. 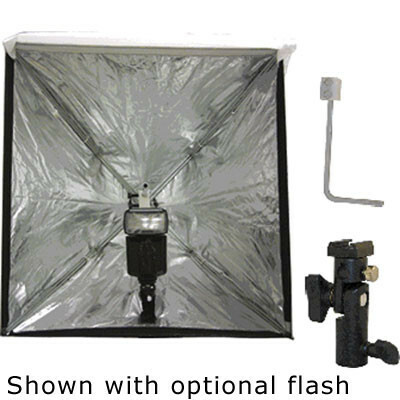 You must set it up so the flash bounces of the back of the softbox to get any diffusion. I really doubt Westcott put much effort into the design of this thing. Rated 4 out of 5 by ddrg from Works as advertised! I mount my Nikon SB-600, with the light facing into the Apollo mini, and it delivers great soft light. I prefer to use this indoors rather than shooting through a white translucent umbrella because you don't get light spilling out in all directions. I have not had any problems angling the softbox up or down, and have been able to turn the flash on / off without opening the diffusion material by simply pressing on the material over the flash power button. My only complaint is that the front diffusion material could have been a little larger to allow it to more snugly fit around the inside of the softbox structure. It would have been nice to have included a pounch of some sort to carry the softbox, L-bracket and light stand adapter. Rated 2 out of 5 by Anonymous from Too delicate to be useful The box was missing a part, had to return and get another. great: size, portability. not great: not a solid product, still having trouble assembling it. Not sure how long it will last in the field. Rated 5 out of 5 by Troybphotos.com from Simple and Inexpensive Great softbox for small flashes. Sets up quick and doesn't tale up much space.